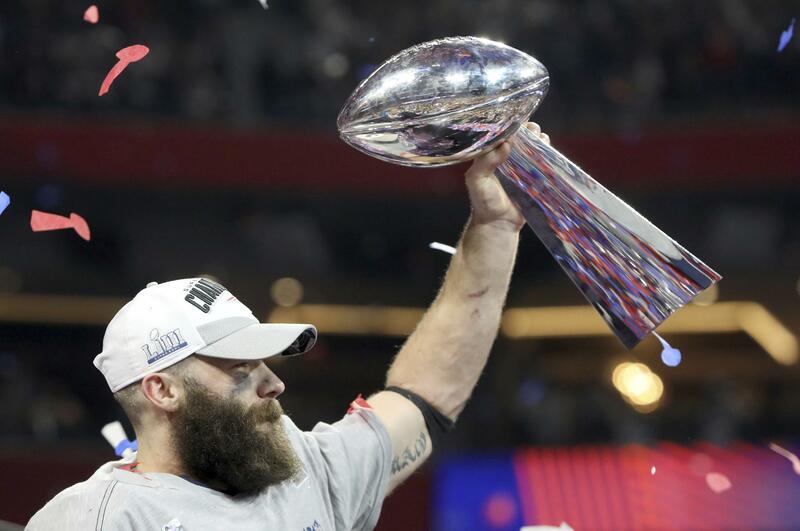 UPDATED: Sun., Feb. 3, 2019, 10:49 p.m.
ATLANTA – The New England Patriots wrecked this Super Bowl, and that’s meant as a compliment. They bull-charged it, and broke things up, and made everything unexpectedly dull, with the exception of one pretty play from Tom Brady to Rob Gronkowski. They won it, 13-3, over the Los Angeles Rams the way they have played all year, so strangely great and yet not great, and if nothing else, so much better than anyone ever gave them credit for. “Pretty ugly,” said MVP Julian Edelman, smiling. It was a historically lousy offensive game, a matter of two stymieing defenses and coaches outthinking each other, and of 33-year-old Rams coach Sean McVay outthinking himself. The lowest-scoring Super Bowl ever was a grinding, bone-shattering game that sent Patriots safety Patrick Chung to the locker room early in the second half with a busted arm and made running back Rex Burkhead’s mouthpiece fly into the air along with the spit that was knocked out of him. “We were just chipping away,” Brady said. A light and elegant Rams offense accustomed to having its way suddenly couldn’t get what it wanted, at all. After eight straight punts, you wondered how 24-year-old quarterback Jared Goff held his head up. Yet he did, to his credit. To enjoy this game, you had to love spectacular breakups – such as Jason McCourty’s batting away of that seemingly sure-thing end zone pass that Goff launched to Brandin Cooks late in the third quarter. Or the pile-driving sack that Dont’a Hightower and Kyle Van Noy laid on Goff two plays later, holding the Rams to Greg Zuerlein’s 53-yard field goal with 2:11 left in the third quarter that tied it at 3. “We got completely outplayed,” Goff said. It was too big for McVay, the youngest coach to reach this game, and at times for Goff, so baby-faced that he looked as if he were on spring break from prep school, and who seemed almost tremulous during the anthem, his hand-over-heart fluttering against his chest. McVay was still a high school quarterback when Brady and Bill Belichick won their first Super Bowl in 2002. Goff was 7. “We’ve got some good football players that you feel like no moment is too big for them,” McVay had promised. And that was true. But they were up against a Patriots outfit with 36 Super Bowl veterans on its roster, some of whom, such as Brady and Edelman. had been together for a decade or more. The Pats weren’t giving a thing away about how to handle it. Brady, asked early in the week whether he had any hints for Goff, said shortly, “I’m not giving him any advice.” The 17-year age gap between them was so gaping that Goff couldn’t really recall his first memories of Brady. “To be honest, I don’t,” he said. It was far from guaranteed, however, that time and experience would actually work in the Patriots’ favor. All year they had heard skepticism: Surely, according to the laws of math and nature, they couldn’t keep up their unfathomable run, reaching Super Bowls at a 50 percent rate, nine times over the past 18 seasons. When they started 1-2 and then lost an uncharacteristic five regular-season games, they seemed to be eroding. But as it turned out, it all played straight into their hands. What better way to take the pressure off a trophy-surfeited team with chronically exaggerated expectations that struggles to maintain its grind and motivation? Put it in an underdog role. The outside skepticism turned the Patriots into a team of bonded, ferociously sweaty toughs whose thick stubble and beards seemed to sum them up. Edelman’s beard had grown to lumberjack proportions by game day. “I shaved two days ago. It just came back,” he joked. There was no telling how long it had been since center David Andrews had washed his matted hair. “I don’t shave or cut my hair. It’s not part of my routine,” he deadpanned. They didn’t have as much youth or speed or dazzle as the Rams, no. But they had inner fortitude, and they had know-how. Published: Feb. 3, 2019, 9:58 p.m. Updated: Feb. 3, 2019, 10:49 p.m.